“Demonstratif” may sound like such an overbearing and intimidating lesson, but trust me, this is among the easy ones. This lesson comes in two parts: the first part will cover demonstrative adjectives while the second part will talk about demonstrative pronouns. As previously discussed in the lessons about French adjectives, adjectives are words that describe or give further information about a noun. Demonstratives do that too. In French, the word ‘ce’ covers the entire demonstrative adjectives. This will, however, change its form depending on the kind of noun it is referring to. For singular masculine, we use ce, or cet for words that begin with either a vowel or an h.
Both ce and cette can refer to ‘this’ or ‘that’, and it is usually understandable which one the speaker is referring to, based on the context. The same with plural feminine, it is also ces. Remember, there is no “cettes”. Ces can refer to either ‘these’ or ‘those’, regardless of the distance of the noun being pointed out. ce always comes BEFORE the noun it is referring to, no matter what its form is. If the speaker wants to specify exactly which noun he is referring to in relation to its distance from the said noun, -ci or -la is added at the end of the noun. -ci points out the item’s nearness to the speaker, -là to mean that that it is far from him. And that’s it for the demonstrative adjectives. Now we move on to the second part. 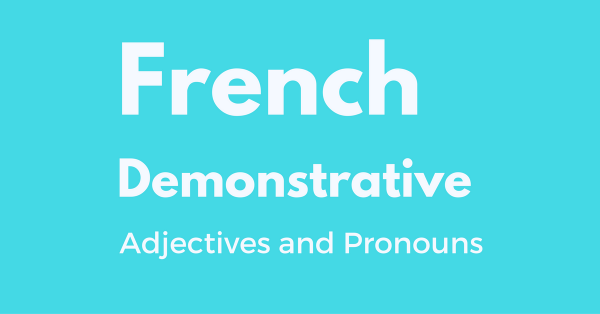 French demonstrative pronouns work the same way, except that they have to agree with the nouns they’re replacing, and a different set of words are used and not the same ones as the demonstrative adjectives. Ce goes together with the verb être which means to be. ce becomes c’ when it comes before a verb that begins with either e or é.
ce becomes ç’ when it comes before a verb that begins with a.
Cela and ça both mean it, this, or that, and could refer to either a statement, an idea, or an object. The difference between the two is that ça is the less formal one and often appears in everyday speech. Ceci is not as commonly used as cela and ça. Its uses are: to refer to something that hasn’t been previously mentioned, or to show someone a certain thing. Celui means the one, and the rest are the different forms you use when referring to its feminine and plural forms. With de to show that it belongs to someone. Demonstrative adjectives are used to point out something and indicate a specific noun. In English, these are the words: this, that, these, and those. In French, we use ce and its different forms namely ce (or cet), cette, and ces. Demonstrative pronouns take the place of a noun. These are the words ce, cela, ça, and ceci, and celui. The other forms of celui are celle, ceux, and celles.